Bob Rebagliati is a native of British Columbia and of Kelowna, in the Okanagan Valley. He holds a Bachelor of Music degree, a Teaching Certificate from the University of B.C., and a Master of Music degree from Western Washington University. While an undergraduate, Bob was involved in performances as a clarinetist, pianist and a percussionist. His main post-graduate activity was the writing of an extensive manual for the development of the young jazz rhythm section. 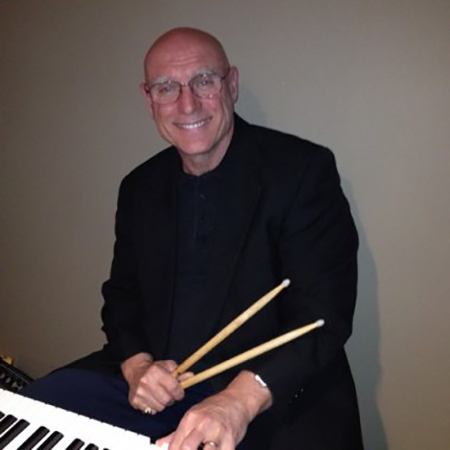 He has continued to write curriculum in the areas of jazz rhythm section, jazz rehearsal techniques, jazz improvisation and concert band percussion. For 33 years, in the North Vancouver School District, Mr. Rebagliati directed many award winning junior and senior high school ensembles in both concert band and jazz areas. In 1976, his jazz ensemble from Hamilton Junior Secondary School won first place in the Canadian Stage Band Festival. Again, in 1979, both his Handsworth Secondary Junior and Senior Jazz Ensembles qualified for the National Finals, with the Senior Band being awarded a special plaque “for most significant contribution to jazz”. In 1986, the Handsworth Junior and Senior Jazz Ensembles won the highest honour in the country – the gold award – first place in their classes. Again, in 1988, his Senior Jazz Ensemble places first at the national festival (then called Musicfest Canada). At Musicfest Canada 2002, the Handsworth Senior Concert Band percussion section was awarded the Zildjian Percussion Scholarship in recognition of “Excellence In The Art of Percussion”. As a music festival adjudicator and workshop leader, Mr. Rebagliati has travelled throughout B.C., Saskatchewan, and to Manitoba, Toronto and Ottawa. He is well known for sessions covering concert percussion, jazz rhythm section, jazz interpretation, improvisation, and rehearsal techniques. Bob has been a guest conductor and clinician of honour concert band and jazz groups around the province of B.C.. During many summers, he has been an active group leader and teacher at music camps. Over the years, Bob has arranged music for jazz and concert bands. In 2004, his composition TONAL GESTURE for concert band was premiered in Vancouver. At the 1991 B.C. Music Educators Conference, Mr. Rebagliati was honoured with the annual Professional Educator Award. In December 1991, Bob was presented with a Distinguished Citizen Award by the District of North Vancouver. In 1992, he was presented with a CANADA 125 medal by Mary Collins, MP. In 1994, he received the North Vancouver Music Educators’ Award of Excellence. In May 1998, his jazz program at Handsworth School was awarded the High School “Jazz Program of the Year” by Jazz Report Magazine of Toronto. In 2001, Bob commissioned three compositions to celebrate his 25th year of music teaching at Handsworth School. In 2004, his final year of (high school) teaching, Bob premiered a musical collaboration by two of his jazz alumni, Renee Rosnes, a well-known pianist and composer, and Darcy Argue, New England Conservatory grad and composer/arranger. At this time Bob also received the Leadership In Music Education Award from the Coalition For Music Education In B.C. “for many years of outstanding contributions to the music education community”. In June 2004, his Senior Jazz Ensemble was the first school band chosen to participate in the Vancouver International Jazz Festival Student Intensive, with a performance on the final day of the festival. Bob was the director of the North Vancouver Youth Band 2005-2008. Bob received the Jazz Supporter Of The Year award from the Envision Jazz Festival in 2009. He is a Vice Chairman of Instrumental Jazz for MusicFest Canada and is responsible for the auditioning of members of the CONN-SELMER CENTERSTAGE BIG BAND and MUSICFEST CANADA jazz scholarships. Since 2005, Bob has auditioned the Vancouver Jazz Festival Student Big Band for the annual TD Vancouver International Jazz Festival. Bob directed the Metro Vancouver Firefighters Band from 2010 – 2014. As of September 2016, Bob assumed the directorship of the Vancouver Symphony Orchestra School of Music Big band. Bob holds memberships in the British Columbia Music Educator’s Association, Canadian Music Educator’s Association, British Columbia Band Association, Canadian Band Association, Coalition for Music Education in BC, Coalition For Music Education In Canada and Jazz Educator’s Network. Throughout his career, Mr. Rebagliati has been appreciated for his dedication and insistence on excellence. He resides in Maple Ridge with his wife Maggie, where he is a freelance music educator, guest conductor, pianist, percussionist/drummer.